Earlier this year, the final installment of the Three Flavours Cornetto Trilogy, also known as the Blood and Ice Cream Trilogy, started making the journey towards the big screen with respective Shaun of the Dead and Hot Fuzz star and director Simon Pegg and Edgar Wright beginning the writing process. 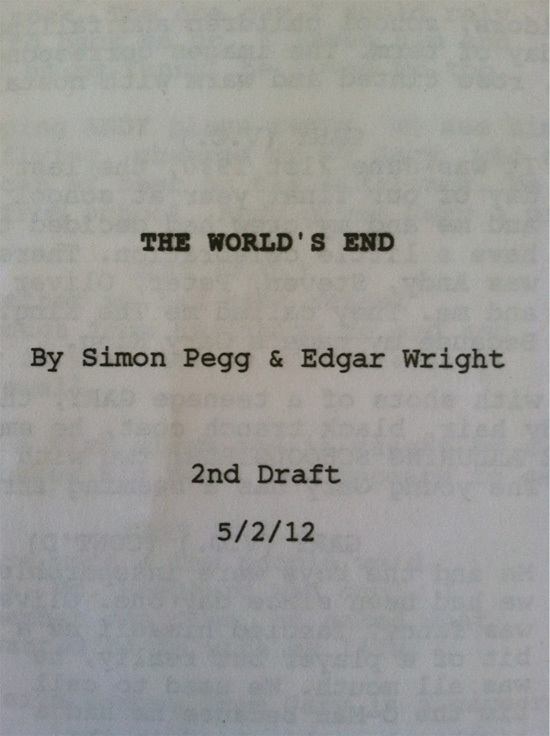 The World's End has been anticipated for some time, and now just a few months after their announcement, Pegg has revealed that the script is finally finished. With a photo of the title page of the script (which appears to be the second draft), and a promise of production after Star Trek 2, it's time for the apocalypse! While to American readers it might seem like the script was finished in the future on May 2nd of this year, European dates are flipped, so the script was actually completed on February 5th of this year. Pegg's photo was accompanied by the tweet, "I know we took our sweet time but as soon as I get back from outer space, we can finish this thing once and for all." So once Pegg is all finished with his acting responsibilities on J.J. Abrams' Star Trek sequel, it sounds like The World's End will start shooting then. I'd imagine that the film should be in front of cameras by this fall, maybe this winter at the latest. I can't wait. How about you? while it's too soon to get too excited: !!! American Dates are flipped haha Great News, Can't wait! I was desperately trying to read through the paper. LOL. Me too, my friend.